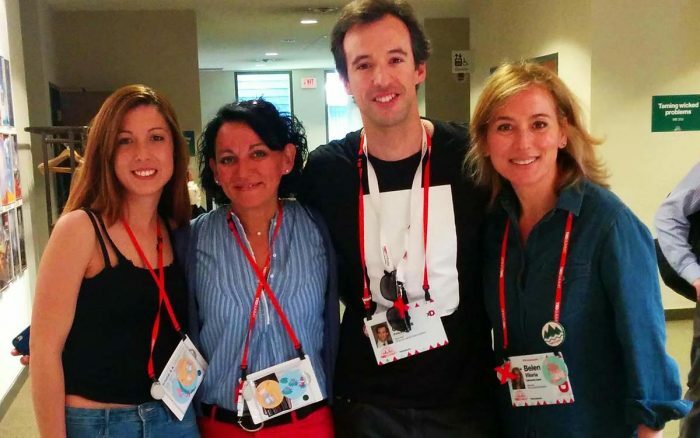 Even after having left TED Summit over almost two months, it is still difficult to try to put into words, everything I brought from my presence at an event of this mental dimension. The contact with change makers from more than 50 countries, having attended talks from some of the best speakers in the world and participated in workshops directed by international recognized professionals, everything inside an overwhelming natural park, made this a remarkable and complete experience, at a professional and personal level. 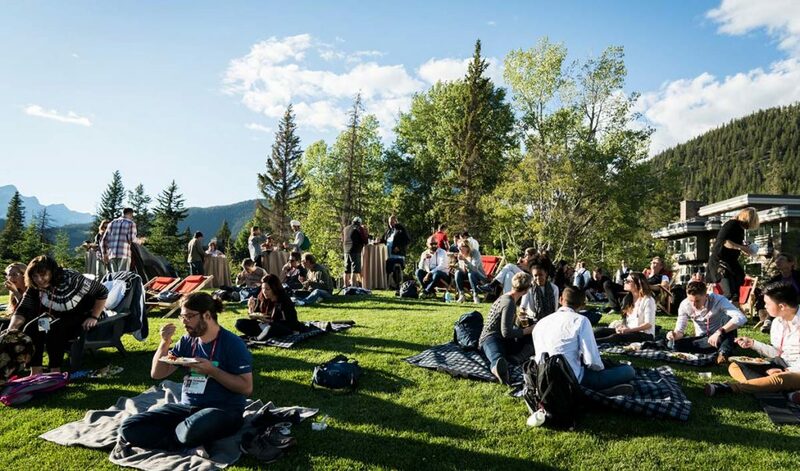 The conference place, inside Banff National Park, but slightly away from the city of Banff, was the perfect place for the event, creating an immersive atmosphere, propitious to avoid distractions from all that was external. Throughout the day, until the dinner time, our environment was usually ‘limited’ to the big complex, where there were big indoor and outdoor eating areas, dozens of rooms for workshops, the interior auditorium, an outdoor amphitheater and a huge lawn surrounded by trees. Relative to the organization, the event was planned rigorously, as usual. The punctuality at the beginning and end of the activities was respected to the second, and everything worked perfectly synchronized. That gave everyone a sense of comfort and we could simply focus on the experience. 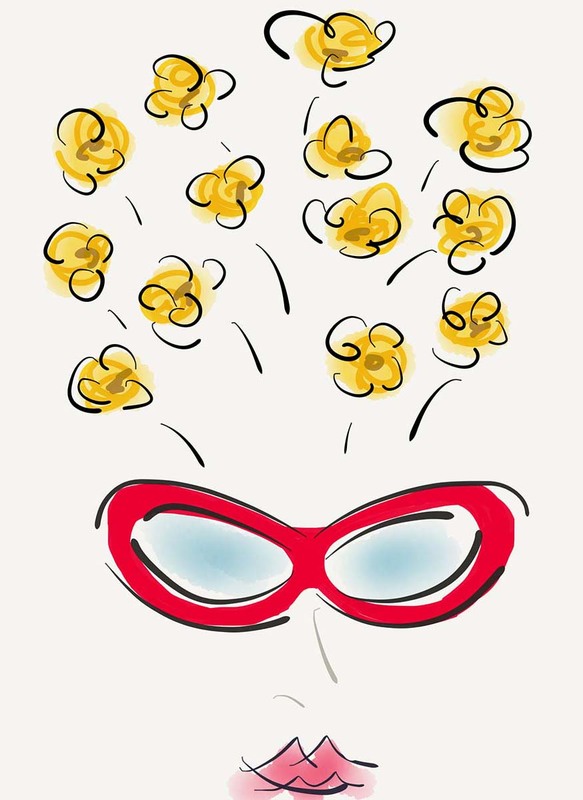 A very special mention to all the TED team and volunteers, that created a portentous event, always with a smile on their faces and making everything look easy and simply. 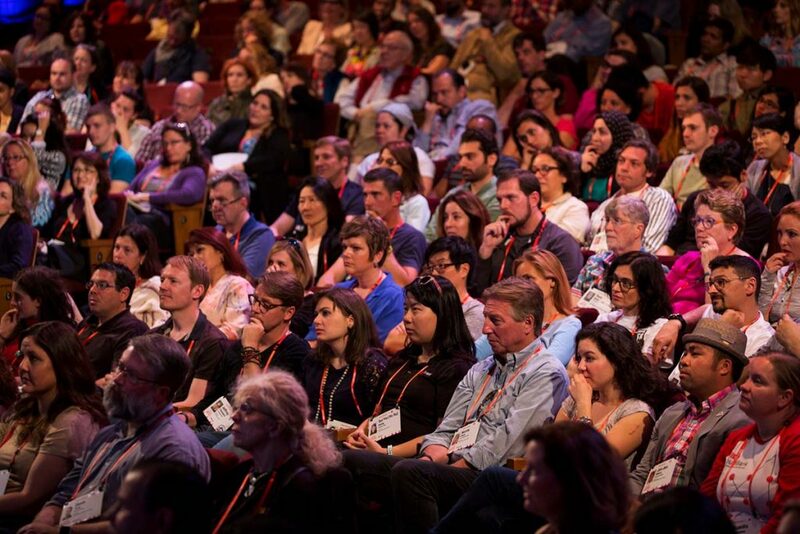 TEDx organizers know that it isn’t. Regarding the attendees, EVERYONE had (has) an amazing cultural level. Curious, clever, dynamic, ambitious, resilient, passionate about innovation and trends, always aware of what is happening in each part of the world. People with whom you can talk to about everything, with the certainty that you will have substantial conversations. And even if you don’t get to know 50% of them, it just feels right to call each one of them as ‘friend’. And with this friends, that are always genuinely interested in what you have to say to them, you feel that you are learning all the time. During meals, between sessions or workshops, through the activities or just by the way the dinning tables were organized, the event powered that the attendees interacted with each other, resulting in the contact with people of different nationalities, cultures, ages and professional fields. Executives from companies like McDonalds or BCG, CEOs of meaningful brands, startup founders, marketing directors, consultants, students, educators, filmmakers, event organizers, scientists, artists, are some of the profiles of people with whom I could connect and have conversations about many different topics. With some of them you are able to set out a closer relationship, which leads to future interactions. And even sharing only some hours with many of them, you leave the Summit missing them. 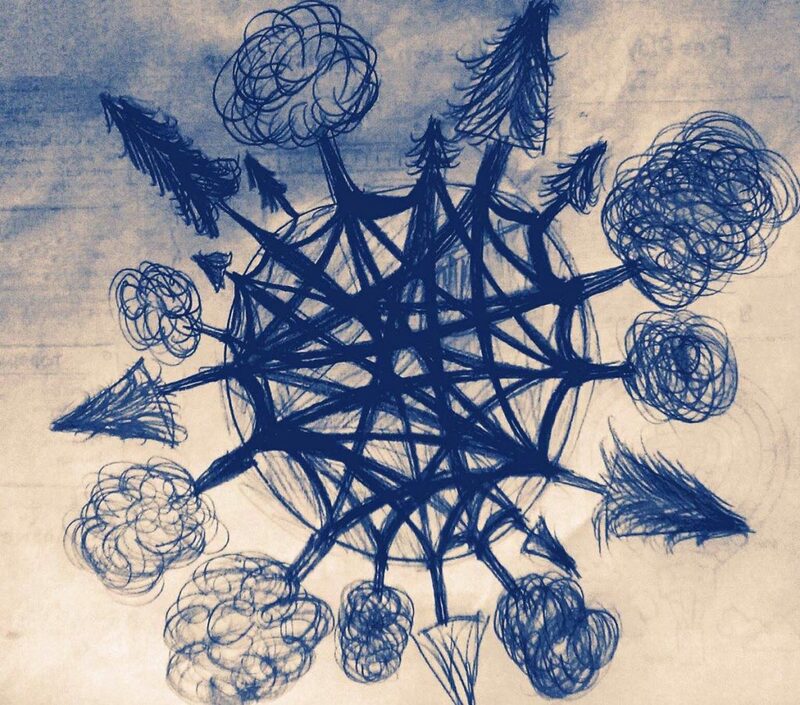 Missing the natural way how conversations flowed, how people were naturally kind to you, and most of all, the simplicity of the interactions. 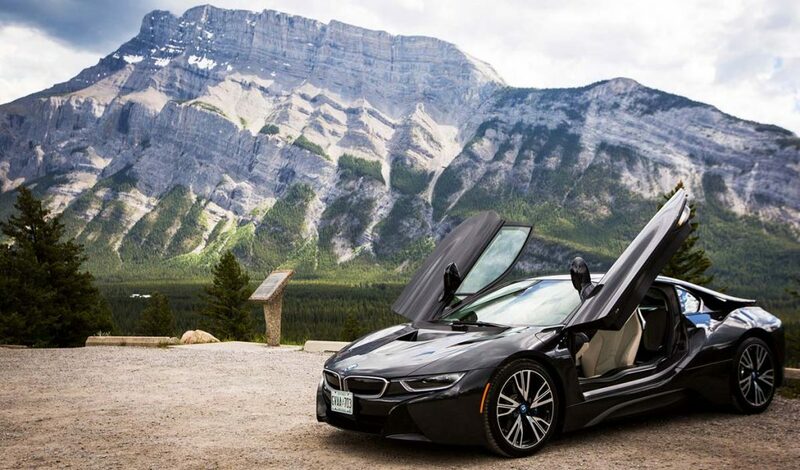 Regarding the activities, there was the possibility to choose between many options like yoga, soccer, tennis, hikes, runs, bike rides, BMW test drives, among others. As an alternative we could just have some free time to explore, gather, work (some had to), or just lay on the lawn. For me, this time was also an opportunity to have some minutes to try to organize my thoughts (so many things happening need time, and some silence, to adjust inside our brain), and have a good time calling my wife and daughter. 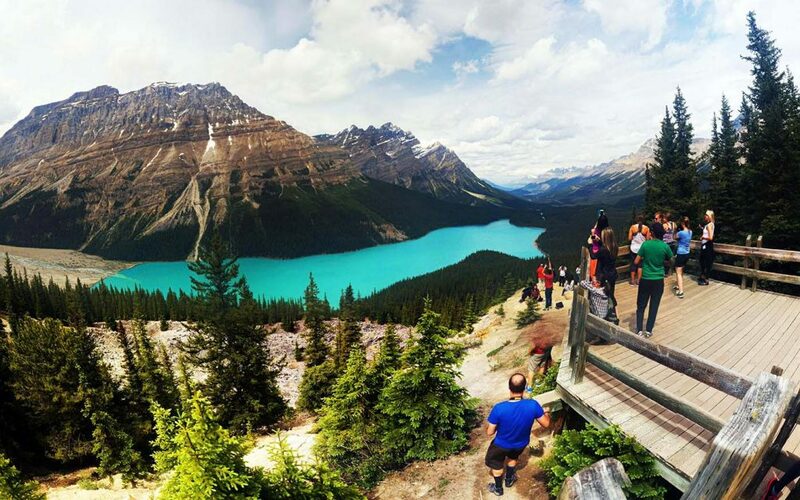 Visit to Lake Moraine. 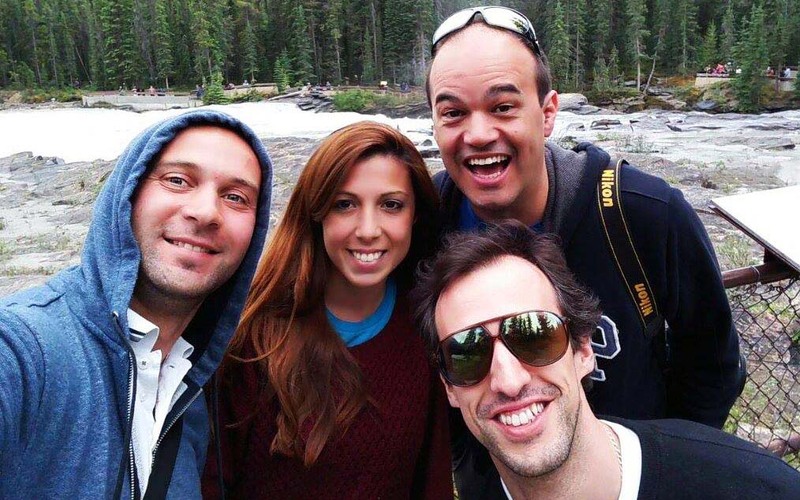 Amazing road trip with Norberto, Igor and Rocio. The workshops were given in a very practical way. It was requested a constant interaction with objects as Post-it, cards, blank sheets or Lego. In the four I participated, each lasting around 90 minutes, we were always urged to design/ test something in group. For all the situations it was powered the collective effort, where the timely completion of the exercises, as the process that led to the solution, was valued. A less successful result was not considered particularly relevant, because trying again was seen as a new opportunity to do better, with the knowledge of the previous experience. 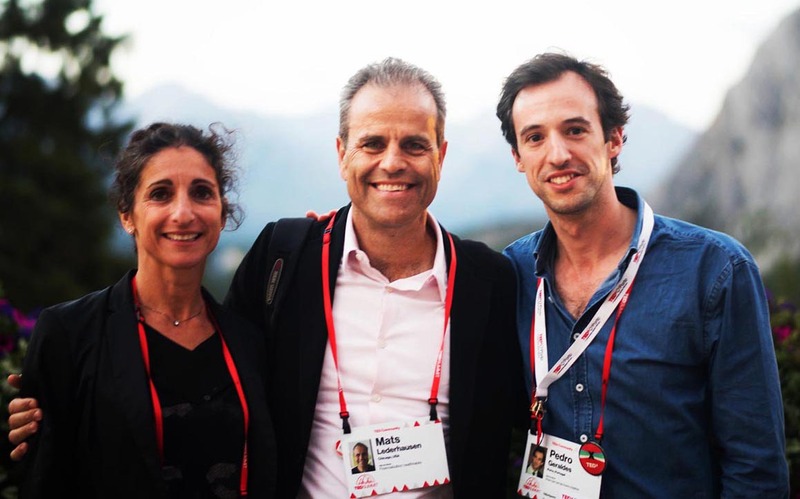 In addition, the professionals who led the workshops were talented professionals, with broad recognition, as Marco Tempest, Francesca Fedeli and Roberto D’Angelo, Don Tapscott, Tom Wujec, Gerry Garbulsky, among others. They enhanced the level of each task, what made things even more interesting. 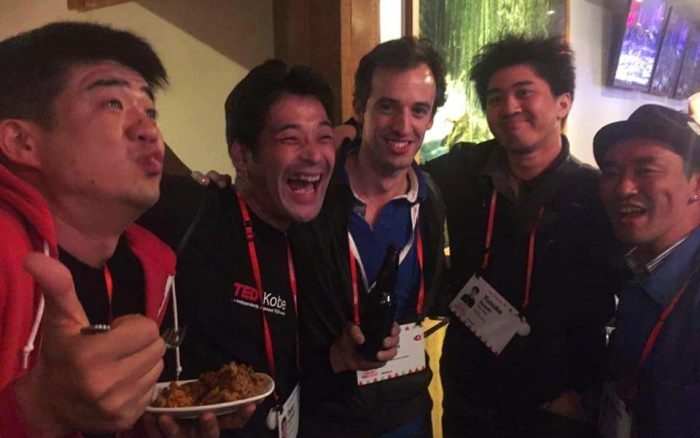 Apart from the workshops organized by TED, I promoted two different gatherings. 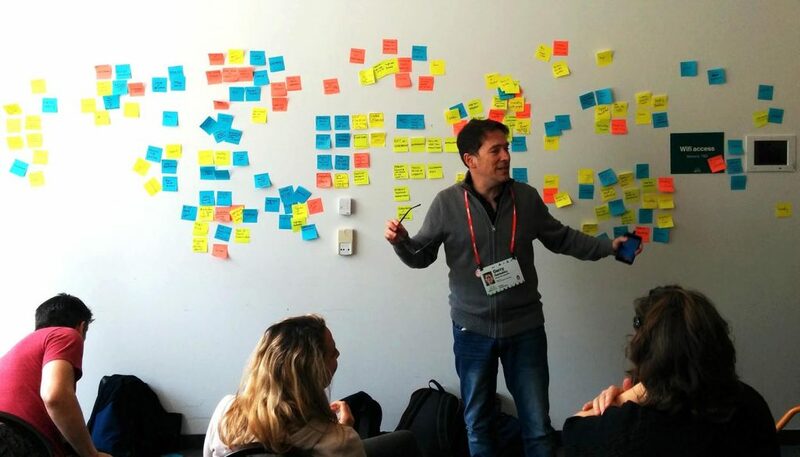 The first was about ‘design thinking‘, where more than 30 TEDx organizers joined to discuss, among other topics, how design thinking could apply to the organization of a TEDx event. The second was about ‘partnerships management‘, where more than 25 organizers shared experiences, discussed constraints and ideas about how we could share, in a more effective way, better methodologies to approach potential partners. Regarding the talks, wonderfully curated by Bruno Giussani, it was possible to realize that most of the subjects were selected based on the actual relevance of the themes, but with a very careful look at the future. As central themes I will highlight Blockchain, Brexit, artificial intelligence, people’s trust (the way it is evolving), big social issues and the urge of the conception of a “new” nuclear power. 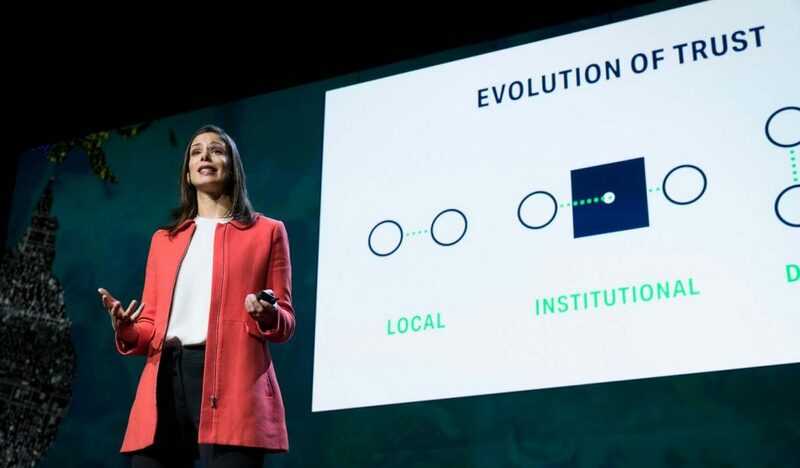 The approach of the speakers to the different themes had, in general, a positive tone, but showing strong concerns about how things could develop, warning that our future truly depends on people’s (individuals, companies and politicians) choices. el Seed (artist, TED fellow), Ngozi Okonjo-Iweala (influential global leader, economist, policy maker, thinker on Finance and Economic Development), Tim Leberecht (marketing and brand strategist, speaker, author), Suzanne Simard (forest ecologist, teacher), Isaac Lidsky (corporate speaker, author, entrepreneur), Ed Boyden (professor of biological engineering and brain and cognitive sciences at the MIT Media Lab), Rachel Botsman (writer, entrepreneur), Jennifer Brea (TED fellow, writer, filmmaker, social scientist), Kevin Kelly (digital visionary), Sam Harris (neuroscientist, philosopher). As a creativity addict, I will point the talk from el Seed, as one of my favorites. 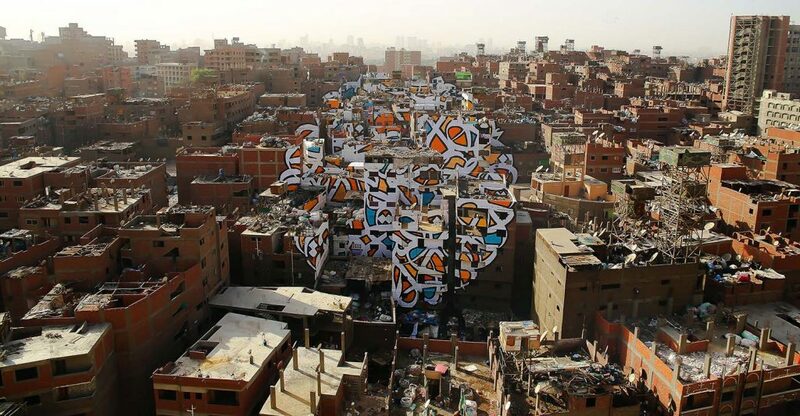 It is fascinating the way he was able to connect art with the community through his work “Perception” (image below), and a great example for all the creatives in the world. The meaning of a piece of Art is so much bigger, when it is able to promote inclusion and power the sense of community. As a personal challenge to take to the Summit, I conceived two objects, symbolizing the importance of putting ideas into action. Of taking risks on the creative level. 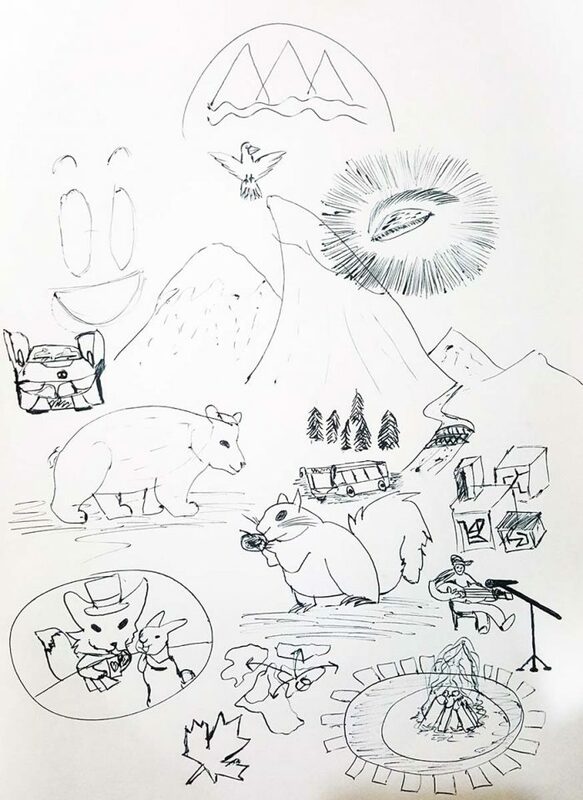 The first object were t-shirts with an A4 size drawable blank space, where I dared people to create things related to the themes discussed in the Summit. El Seed was one of the persons I challenged. 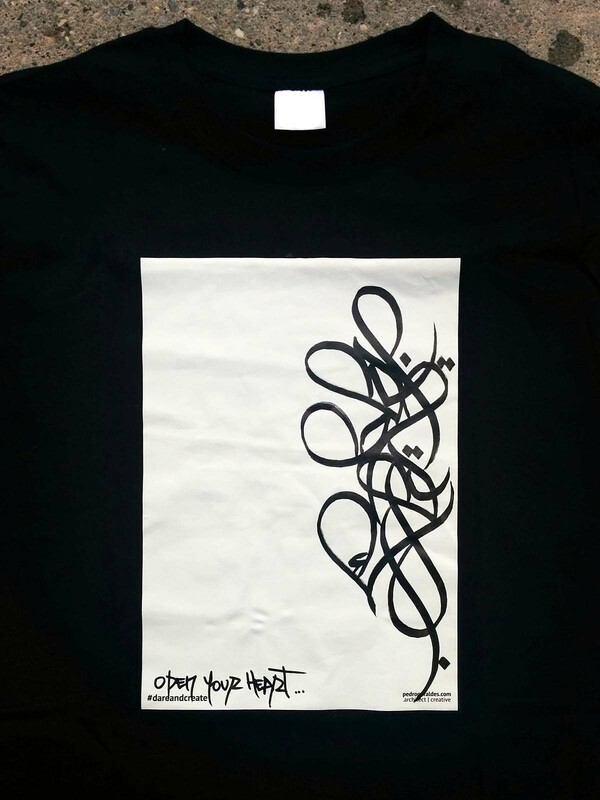 He draw a symbol that means “open your heart”. This will be certainly framed and go to my living room. 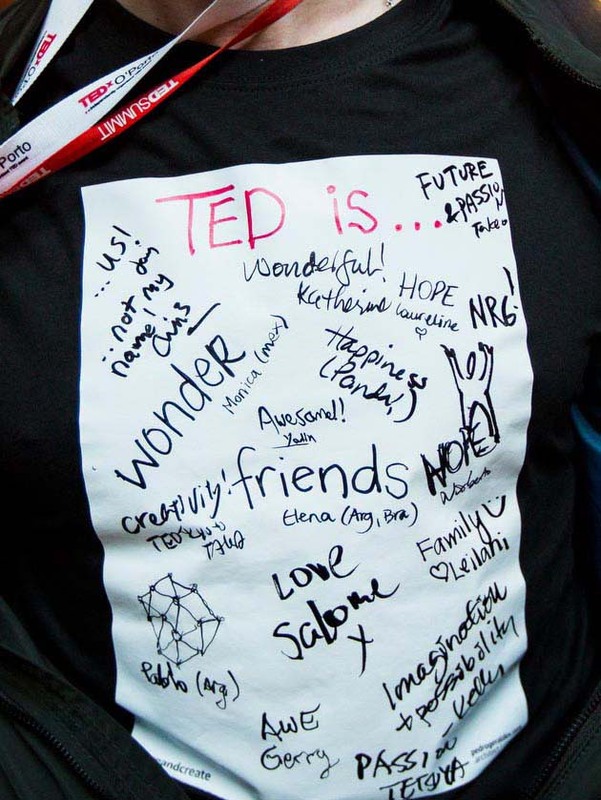 One of the t-shirts was also used to dare the TED team, and some TEDx organizers, to put in one word “what is TED”. 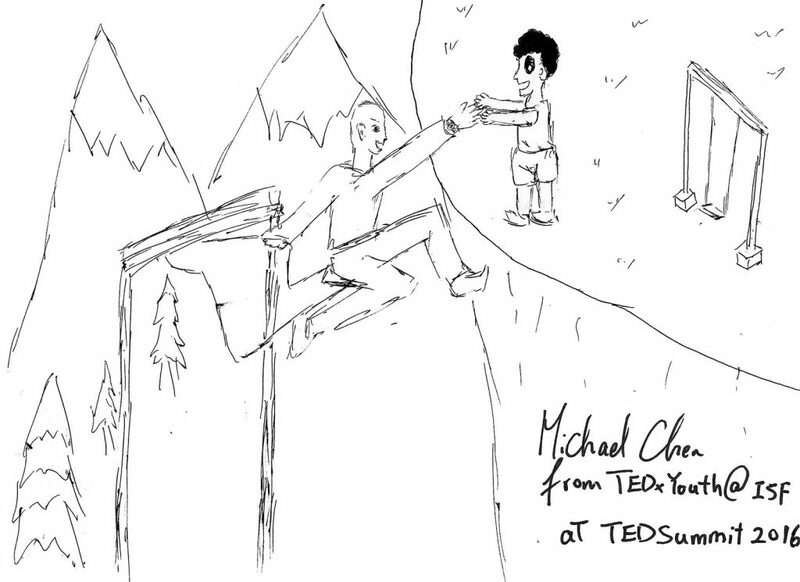 Funny contribution from Chris Anderson, TED Curator, that wrote “…not my name”! The blank t-shirts. Drawing from el Seed. The second object was my new business card: a pencil. My professional areas allow me to meet more than two hundred of new people each year, and to collect many business cards that I keep organized on a drawer, but for which I rarely look. After thinking in some options, the pencil emerged due to one big reason: people actually keep it and use it. The “ideas inside” message wants to make people know that, in order to create, they only have to dare themselves to try. And that what they write or draw, truly matters. 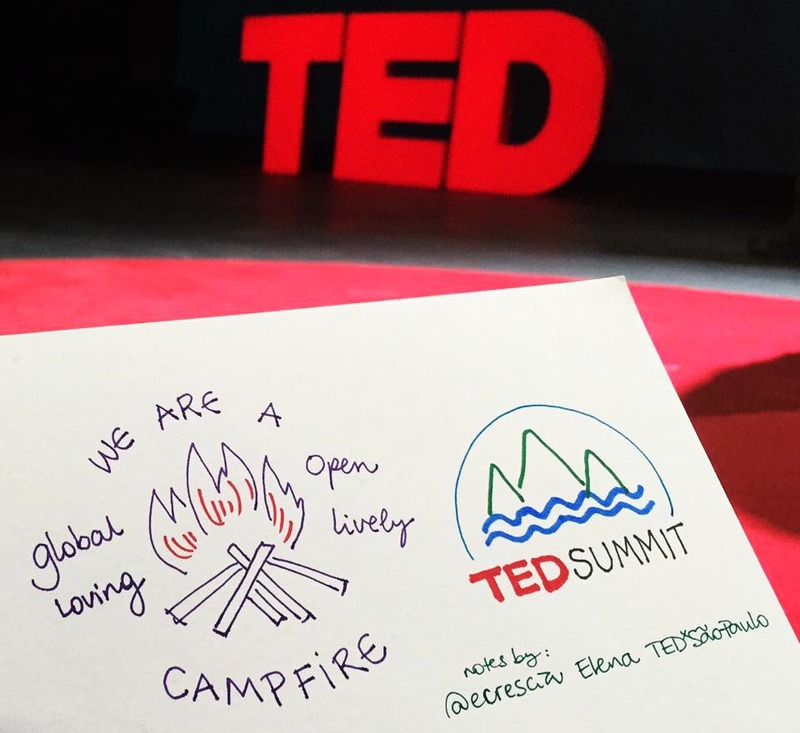 After arriving in Porto, I dared some attendees to create one drawing (A4 page size) that resumed the TED Summit 2016 experience. No words were allowed, but they should feel free to use colors and to try to keep it simple. 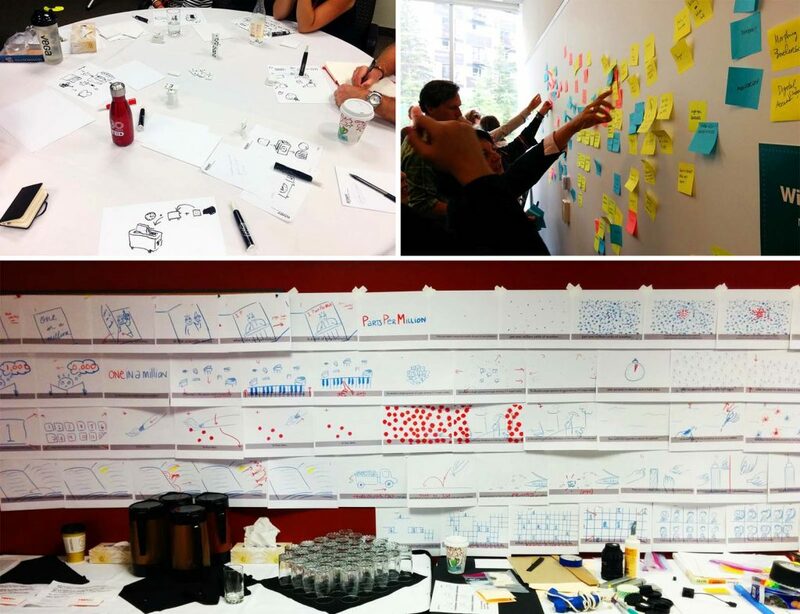 My goal was to compel the attendees to digest and synthesise the experience, powering their creative spirit. 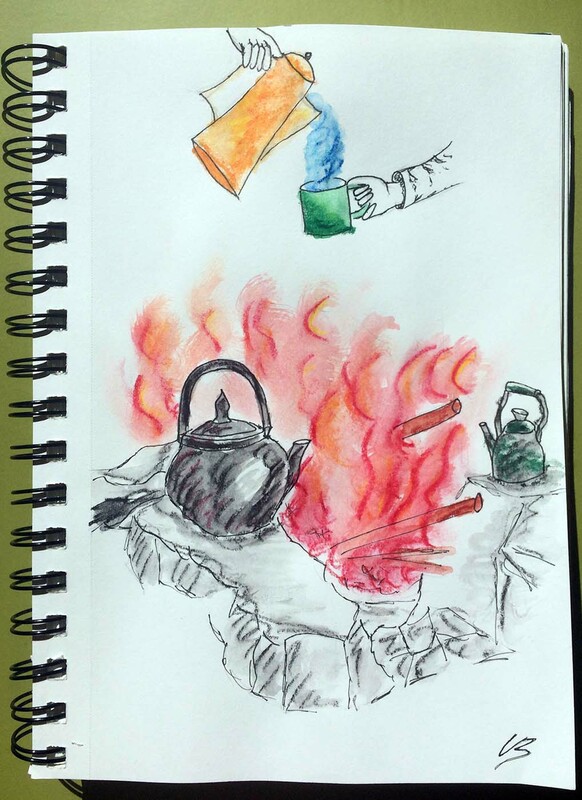 Some adventurers like Catherine Bridge, Nikkisa Abdollahi, Michael Chen, Sarah Harkin and Ahmed Alyousify accepted my challenge and sent me this wonderful drawings, that I display below. Could a text show so directly, what the 6 days experience was all about? Looking at them, isn’t it possible to feel the whole Summit spirit, that I describe in this post? Truly amazing! Previous to my depart, I challenged myself to write a blog page at EDP’s intranet, with the most important updates about the event. 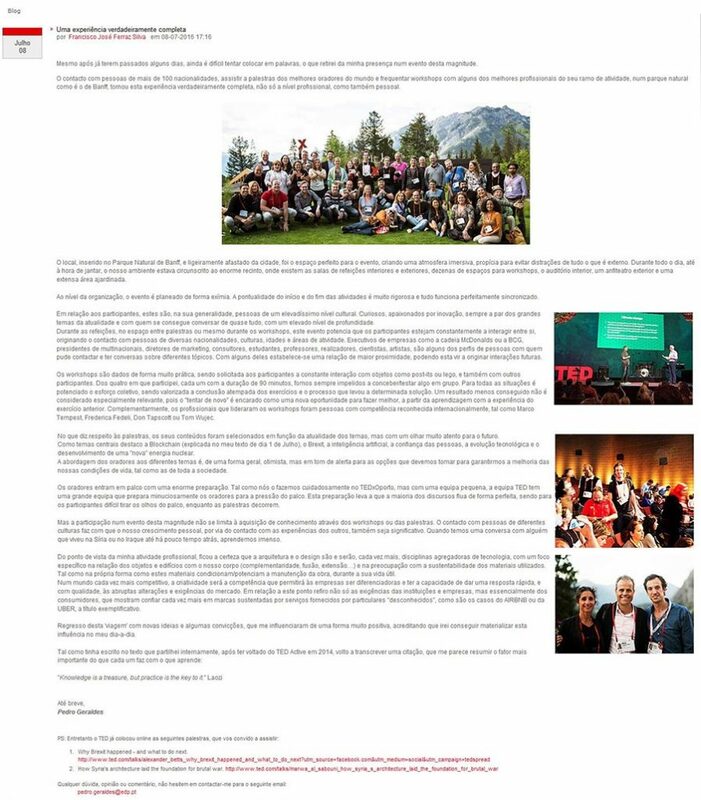 EDP has more than 11.500 employees all over the world, and my main goal was to call the attention to the importance of TED, as to update my coworkers about the big themes that where being discussed. 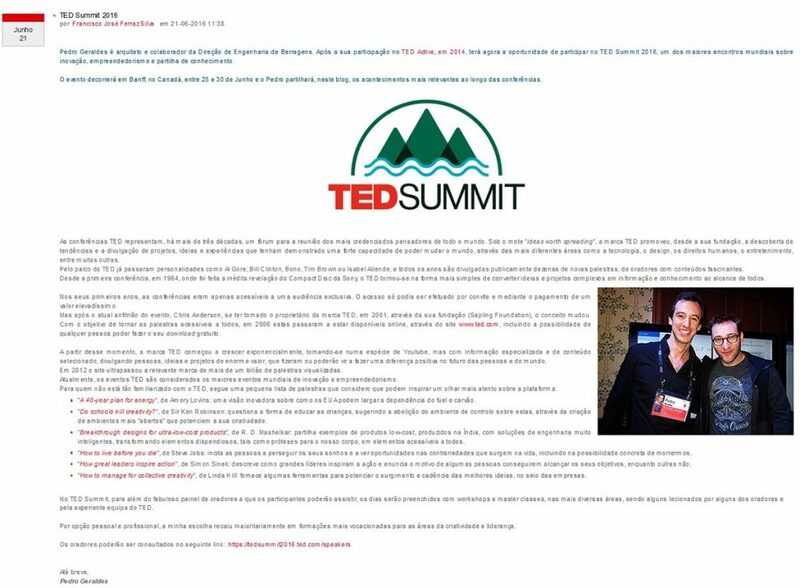 In the end I received lots of positive comments and emails from colleagues that didn’t know TED, and from others that wanted to know more about some specific speakers and themes. The blog page reached more than 1100 page views. 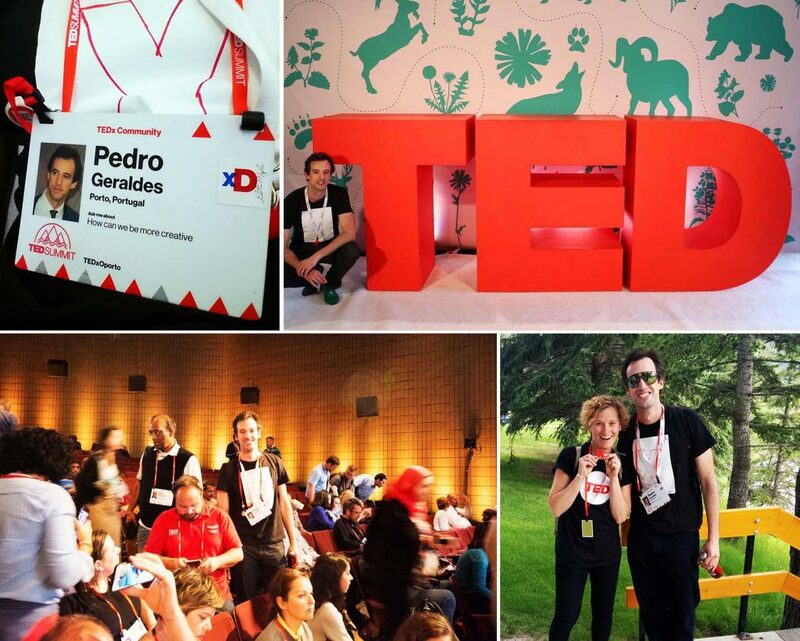 Below are some images of it, where I also mention my TED Active 2014 experience. Although the texts are in Portuguese, it is possible to see that each post is quite long. Almost all of them were written between 1 and 4 am, because there was no time left during the day. And the nights were also a bit ‘complicated’, with dinners, after dinners and after after dinners… Nothing that a double espresso at 8.30am, couldn’t fix. The presence in an event of this magnitude is not limited to the acquisition of knowledge through workshops or lectures. The contact with people from different cultures powers our personal growth, by talking, asking and most important, listening. We are able to learn so much about life having a conversation with someone who lives in Syria or in Iraq, while listening a passionate inhabitant from Leicester, that explained why the local club was able to win the Premier League although having one of the lowest budgets in the competition, or with a TEDx organizer that explained the challenges of producing a TEDx event inside a soccer stadium, among many other examples that, fortunately, I could give. From the point of view of my professional activity, it has become even more clear that, in an increasingly competitive world, creativity is, in my opinion, the skill that will enable companies to differentiate themselves and have the ability to answer quickly, and with quality, to the abrupt market changes and requirements. Consumers are more demanding, want to have the latest products that merge new technologies with an awesome design, and to keep competitive, companies will have to work fast. In order to keep improving and having new ideas, lots of companies will need to change their mindset and start working with the support of talented creatives. In the fields of architecture and design, this are disciplines that will have to include even more technology, with a specific focus on the relationship of the objects and buildings with our body (complementarity, fusion, extension…) and concern about the sustainability of the materials used for the designs. And how these materials affect / enhance the maintenance of the buildings/ objects during its lifetime. This is a great challenge to all the creatives, because merging technology with art and design will compel a strong connection between people from different fields. Amazing brands like IDEO, Saatchi & Saatchi, among others, already help companies to do that for a long time, but consumers will force that this happens in a global way. Designers will simply have to adapt the way they approach each new project. 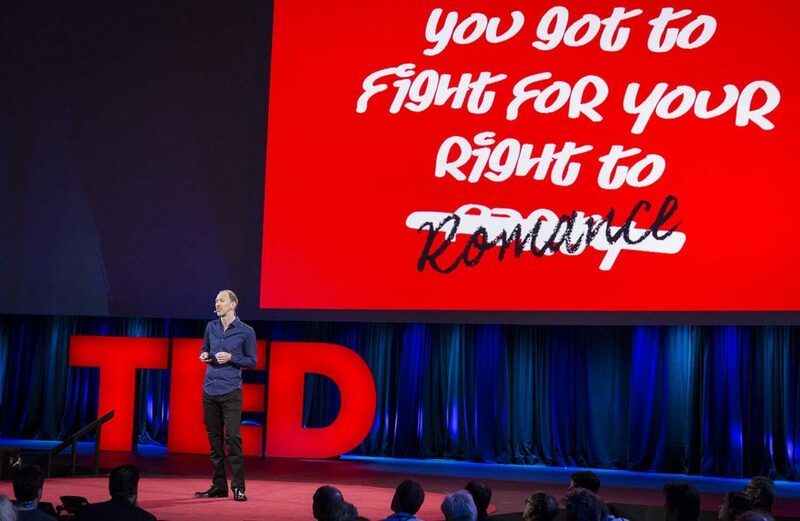 I could not finish this text without saying that this event was just one more proof that TED is one of the most valuable brands in the world. During the event, Chris Anderson asked: “What are we building today that will last 1,000 years?” The answer was ‘ideas‘. And TED is, for so many years, that “offers” ideas to everyone that wants to get them. But the most important thing for me are not the ideas, but the knowledge. The knowledge that we assimilate from each talk. 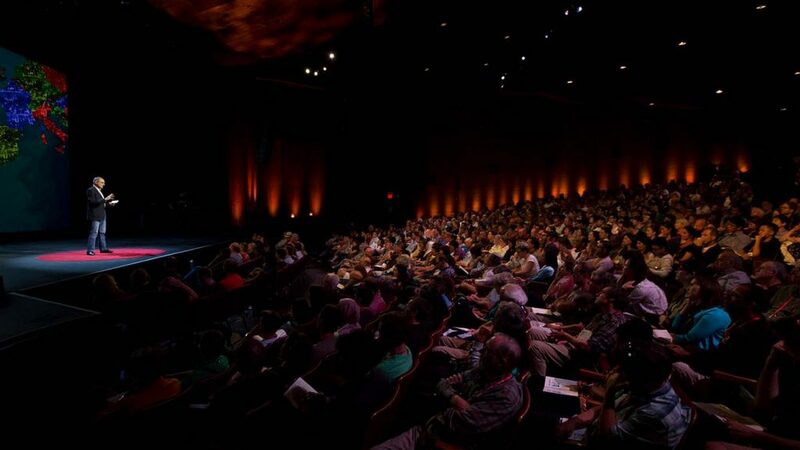 The knowledge that is available, for free, in each one of the more than 2200 online talks. Because more than ideas, knowledge is what allows us to connect dots inside our brains and have new ideas. Thanks for taking me back to TEDSummit and in such a vivid way! Loved every second of it. Thank you. Thank you. Thank you. Excellent work Pedro. Great re-cap and motivating. Thanks for sharing. Thank you Manal, for your kind words. 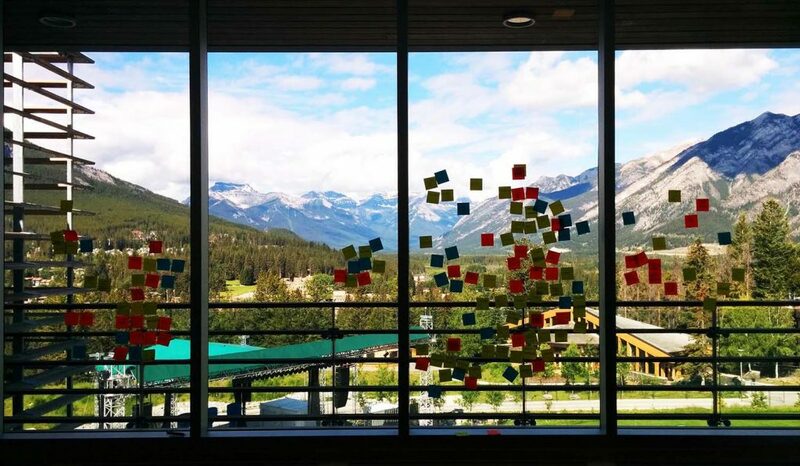 such eloquence, vivid and visceral detail and palpable creativity emit from your Report from the TEDSummit. Thank you for finding the words to describe this global, life-changing experience that, YES, is nearly impossible to describe and contain. It’s an honor to know you! Thank you Andrea. It was also a big pleasure to meet you at the Summit and I truly hope that we can keep in touch. Awesome! You are passion, you are curiosity you are thriving to be better, you are love in capital letters. Thank you Pedro!